There are two views of global warming and atmospheric carbon dioxide, one from the perspective of the entire history of our earth and the life on it, the other without this perspective. It is those who ignore global history, or who are picking only selected parts of it, who are panicking. There are lots of wild-eyed statements being made today about global warming. Examples as I wrote this note in 2006: "Canada's polar bears will be extinct within 25 years as global warming ..." (Ottawa Sun 22 April 2006). "Rapid Warming Spreads Havoc in Canada's Forests" (Washington Post 1 March 2006). The panic wasn't limited to newspapers either: "Global Warming May Have Damaged Coral Reefs Forever" (University of Newcastle upon Tyne 16 May 2006). "By 2050 Warming to Doom Million Species" (National Geographic Society 12 July 2004). A decade later, the nonsense hadn't stopped; the World Meteorological Organisation stated in its 2016 report: the world is into "truly uncharted territory". None of this is new. In 1895 the concern was that an imminent ice age would cause "billions to die"("Geologists Think the World May Be Frozen Up Again", New York Times, February 1895). The first global warming panic came in the 1930's("America in Longest Warm Spell Since 1776; Temperature Line Records a 25-Year Rise" New York Times 27 March 1933), then in 1975 came a switch to a brief panic over major cooling("The threat of a new ice age must now stand alongside nuclear war as a likely source of wholesale death and misery for mankind" Nigel Calder, editor New Scientist). In 2018, we're back to the next ice age("Diminishing solar activity may bring new Ice Age by 2030" Astronomy Now 17 July 2015) combined with "disastrous levels of global warming" (UN Intergovernmental Panel on Climate Change). This page presents some facts: data, numbers. That's what science should be based on. But, weather is extremely variable, as the Ottawa graph illustrates. NASA analyses show in more precise detail how difficult it is to tease trustworthy trends out of such data. In the following graph, red shows the raw data from the Central Experimental Farm, which began taking weather records in 1889 when it was in the country and Ottawa was a few scattered villages. The trend is +7.7 mK/yr. But, the Farm is now buried in the middle of a city of 950,000 people. The black shows the data adjusted for heat-island and other effects of our urbanisation of the past century. The result of over a century of meticulous professional weather measurement: the overall Ottawa area has warmed up by about 0.34 K the last century - the line in green. But, the significance that can be attached to that statement is only 1.3 standard deviations. Even newspaper polls require 3 standard deviations (correct 19 times out of 20). The usual scientific requirement to establish a hypothesis is 5. Most areas of our earth have far less lengthy and reliable temperature records than Ottawa does. The obvious conclusion: modern instrument measurements are insufficient to establish a climate change trend. The earth is currently warming up naturally on the thousand year scale as part of a 1500-year cycle. Descriptions of the weather in the North Atlantic as experienced by the Vikings and their observations of such things as drift ice show that the climate of the North Atlantic was much warmer two thousand years ago than it is today, in fact it's possible that the Arctic was ice-free in the summers then. Of course, polar bears lived through this period without human assistance, in fact they have been around for 100,000 years or so. Most of the species mentioned in the National Geographic report have been around for much longer; colonial corals for over 150 million years, for example. So, our earth is warming up on almost all time scales. Pretending that global warming is all our fault and that we can stop it won't work. We can reduce our contribution, but in the long term all we can do is to adapt, as life on our planet has had to throughout its history. The effect of carbon dioxide on the survival of life on our planet also benefits from a study of the past. The level of CO2 in our atmosphere is currently about 0.04%. True, it has risen from 0.0316% to 0.0377% over the last 45 years. 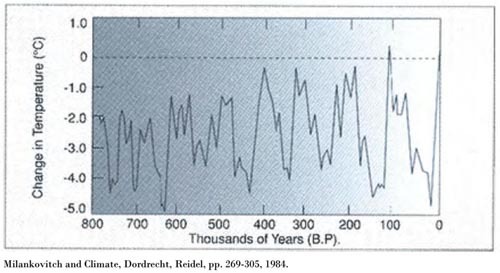 But, only 100 million years ago, our CO2 level was 6 times as high. Millions of essentially modern species lived and thrived throughout that time. Our current level of CO2 is far less than the average over the past 500 million years. If you can, ask those widely-quoted climate modellers what their model says about 0.5% CO2. If they say, "catastrophe", as most will, their model simply doesn't match facts. A possible clue to the modellers' errors may lie in the study of hard shelled marine animals, such as the chambered nautilus which has been around for about 400 million years. If the amount of CO2 in today's sea water is doubled, it becomes too acid for such creatures to live. (That includes all molluscs and corals.) Something was different 100 million years ago, and the only reasonable possibility is the effect of living things. Can existing ocean life increase its metabolism of CO2 sufficiently to keep oceanic acidity low with higher atmospheric levels, even with a different ecology than that of today? Or, were effectively different species with different biochemistry doing the job 100 million years ago? Ice core studies suggest that biological adaptation to changing CO2 levels requires tens of thousands of years or more, so radiation of existing ocean species into new species seems to be required for a return to the past. It isn't the level of CO2 in the atmosphere that's important, it's the rate of change. And, the catastrophic effects on all life on earth, including on us, if the rate of increase in ocean acidity exceeds the ability of the ocean biome to adapt, demands use of the precautionary principle. We are unlikely to be able to adapt to it as we presently exist. Our earth is warming up slowly on average. We must expect it to continue to warm up for a while. And, major global temperature variations, whether produced by greenhouse gases, solar variations, or mechanisms affecting cloud cover, long predate anything we humans have been doing. It would be in accordance with facts for us to take sensible steps to adapt to a warmer world to come. On average, 3C warmer. One of the certain effects of global warming will be a rise in mean sea level. Warming will increase the volume of the seas due to thermal expansion, and via a reduction in extent of mountain snow cover and land based polar ice caps. Over the last 100 years, mean sea level has risen by 10-25 cm. The rate is slowly increasing due to positive feedback effects. When white sea ice melts due to rising temperature, the absorption of solar radiation by dark water increases, a positive feedback that further increases temperature. Glaciers are moving faster than during the past century, probably due to lubrication by their own melt water. They end up in the sea faster, so melt faster. This has happened before in Earth's history - about 81000 years ago, sea level was changing at a meter per 50 years (Doral et.al., Science 263.5148.796). Planning based on facts would immediately stop all permanent construction less than 1 m above current storm surge sea levels. In short, stop investing in future catastrophes such as New Orleans. Coastal scientists generally agree that mean sea level was 6 m higher than today during the last interglacial period; there is evidence for a 20 m rise during an earlier interglacial. Sensible planning would aim to move coastal cities around the world to 1 m above current peak sea levels by 2100, and to an additional meter higher each century after that. Such movement will be impossible for some countries; for example, almost all of Bangladesh is less than 2 m above current sea level. Worldwide, perhaps 500 million people will be displaced by a 1 m rise in sea level. About 100 million of these will have nowhere left to go in their own country. Planning based on facts must provide for the displacement as refugees of about 1 million people globally per year for the foreseeable future, due to sea level rise. What about claims of more violent storms? Paleoclimate data provides a caution. Studies of coastal deposits caused by intense storm surges over the past few millennia show that temperature seems to not be the major factor in their frequency. Donnelly and Woodruff (Nature, 24 May 2007) in particular show that intense hurricanes in the Atlantic Ocean in the past have been better predicted by El Niño and the West African monsoon than by heat. Their data accords with basic physics: hurricanes are powered by convection; convection is driven by enthalpy difference. Absolute temperature affects enthalpy only to second order; an increase in global temperature of 1 C increases the energy available to drive storms by only 5%. We should attempt to ensure that our contribution to global warming is less than that to be expected by natural means, given the huge effects of sea level rise and movements of agricultural production on human affairs. But, the catastrophic effects on all life on earth, including on us, if the rate of increase in ocean acidity exceeds the ability of the ocean biome to adapt, demands use of the precautionary principle. We have to start now. It will take many generations to redirect societal habits and investment as pervasive as the ethos of perpetual growth in energy usage has become. There is no quick fix to our carbon emissions.